Some of the details of the facade at 36-01 Broadway, which is mostly covered with construction scaffolding. ASTORIA — A 1920s-era building on Broadway that was once home to one of the nation's earliest restaurant chains is under renovation, sparking concern from a local historical group that wants to make sure its exterior is preserved. The former Childs Restaurant building at 36-01 Broadway is recognizable for its ornate facade of nautical-themed terra cotta figures. But those details are currently concealed behind scaffolding as crews renovate the property to combine it with a shop next door — prompting worries about the future of the unique architecture. "It's just a beautiful gem of a building," said Bob Singleton of the Greater Astoria Historical Society. "When people walk up and down that street they look at that, they instinctively look at that building." The owners of the property — that was most recently occupied by a Rite Aid — are combining the now vacant space with the DII discount shop next door to it, according to Morris Dweck, who works for the variety store chain. The company was just made aware of the community's interest in preserving the facade after receiving an email about it on Thursday, Dweck said, and it's still determining what to do to address residents' concerns. He was not ready to comment specifically on plans for the facade, saying they need time to look into it. Meanwhile, Singleton says he plans to submit a request to the Landmarks Preservation Commission to evaluate the property for potential conservation. Childs Restaurant was a chain launched in 1889 with its first location on Cortlandt Street in Manhattan. It grew to more than 100 eateries in 33 cities by the mid-1920s, according to a report by the LPC. There are still several buildings that once housed Childs locations standing across the city, many of them with similar ornately decorated facades, according to Forgotten New York. The city designated two of the company's former locations in Coney Island as landmarks in 2003 and 2010, one of which is being restored as a restaurant and rooftop bar with an amphitheater next door. 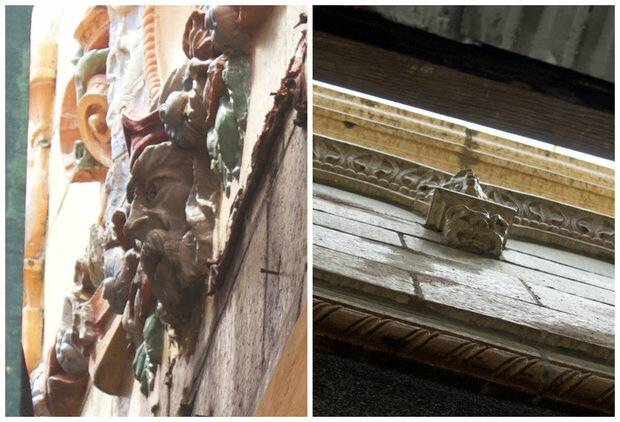 It's not clear how long the location at 36-10 Broadway — adorned with terra cotta figures of seahorses, shells and the face of King Neptune — operated as a Childs. The building was erected in 1928, city records show, and the storefront has also housed a five-and-dime shop and a P.C. Richards over the years, according to Singleton. "This is a really an historic chain and the building itself it architecturally significant," he said. "Childs itself was the first restaurant chain really to serve the needs of working people." He said he was heartened by the community's response after he posted about the building on the historical society's Facebook page, where one person said she'd contacted the DII chain to tell them she would "never shop there again if this is destroyed." "This has resonated a cord with everybody," Singleton said. "People in the neighborhood consider this to be a special building."